We called it back in December in our list of "dos and don'ts" for what was then being called Assassin's Creed: Victory, and now we know it's going to happen: Assassin's Creed Syndicate will have a DLC campaign all about Jack the Ripper. The DLC was announced at the Tokyo Games Show, and there is a trailer. The DLC is set in 1888, twenty years after the events of the main game. The trailer appears to be narrated by Jack the Ripper himself, with lots of shots of one of his targets: her silhouette, her lips, her waist, her neck. "I love my work," he says, "And want to start again. Try to stop me." 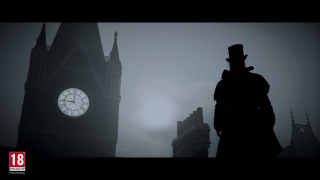 According to VG247, you'll join Inspector Frederick Abberline, a genuine Scotland Yard inspector during the period, to hunt down Jack the Ripper. In real life, the murderer was never found of course, so it'll be interesting to see how Ubisoft resolves the mystery, and what motivations they decide the murderer had. Presumably he'll be a Templar. There's no word on when the DLC will be available, but I guess we should focus first on getting the game itself, a month later than it comes to console.